You're busy, involved and passionate about life! Being pro-active about your health is important. 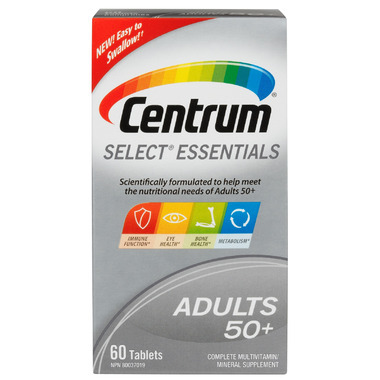 To help maintain the right balance of vitamins and minerals, a specially formulated multivitamin like Centrum Select can be an important addition to your healthy lifestyle. Suggested Use: Adults - 1 tablet daily with food. Caution: Take a few hours before or after taking other medications. Do not exceed the recommended daily dose. If taking other supplements, read label, as other supplements may contain the same ingredients. In case of accidental overdose contact a physician or poison control centre immediately. Consult a healthcare practitioner prior to use if you are taking blood thinners.